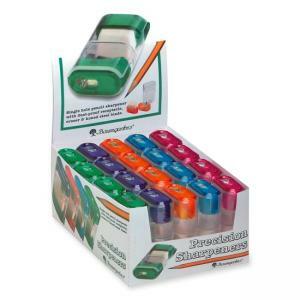 Pencil sharpener features a built-in handy eraser, honed steel blades and a built-in dust-proof receptacle. Made for use with standard-sized pencils. Dustproof receptacle allows you take it with you wherever you need to go without the risk of spilling the shavings. Pencil sharpener meets or exceeds standard for RoHS compliance for lead, mercury, bromine, chrome and cadmium.